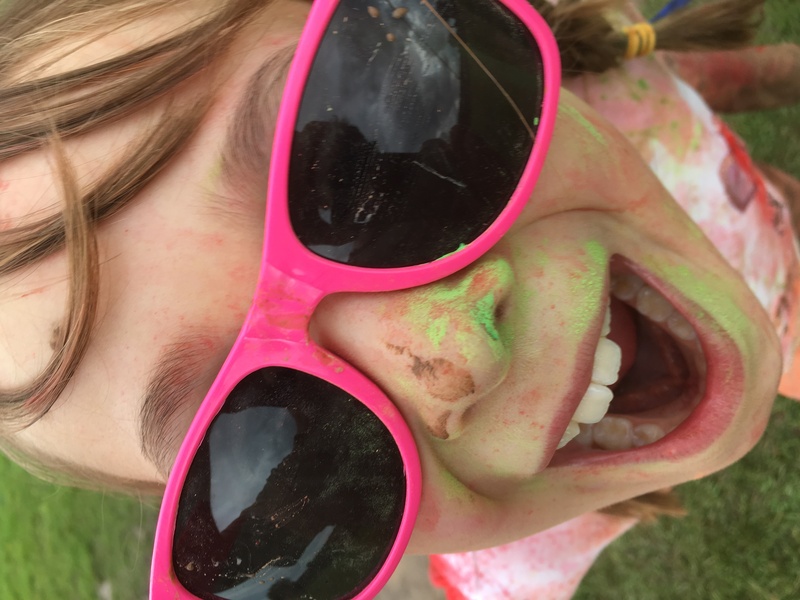 On Sunday afternoon we went to the Bear Trails 1st ‘colour bomb’ birthday party. The Bear trail is in Cullompton and is approx. 20 mins from Smallicombe Farm and is an outdoor adventure trail with lots of optional mud. Megan had been last year with Brownies but Hattie and my first visit so I didn’t quite know what to expect. 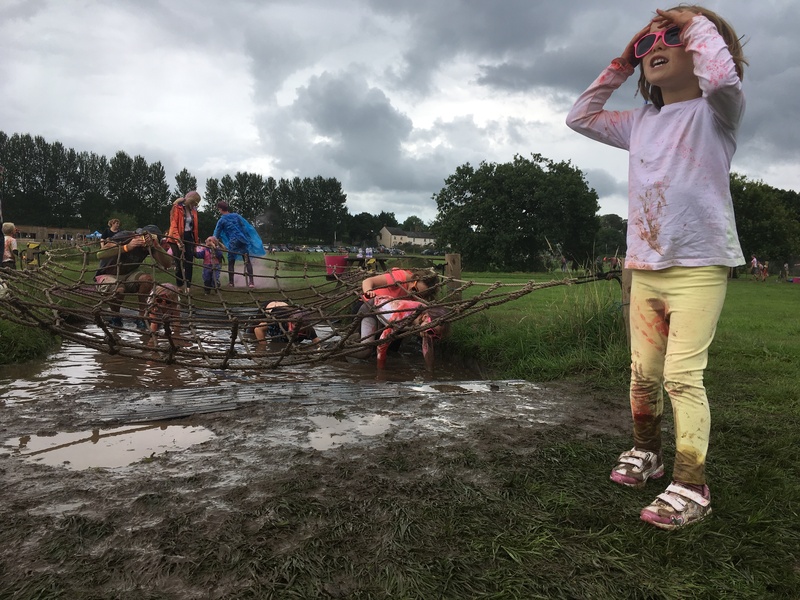 As it was The Bear Trails first birthday they had arranged a ‘colour bomb’ day, similar to the colour runs for charity, so there was not only going to be lots of mud but also lots of colour! 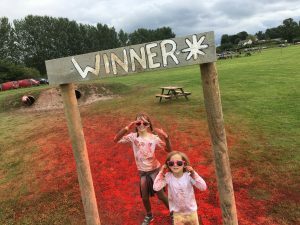 We were all kitted up in very old, white or brightly coloured clothes that I was fairly pleased about because as I arrived I bumped into a couple of friends who had just completed the course…. 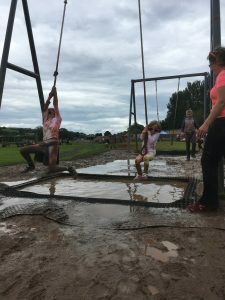 The course had been built by the ex-army owner Ben and is a series of obstacles, including cargo nets, tunnels, rope swings, zip wire, bear mountain and wobbly bridges. 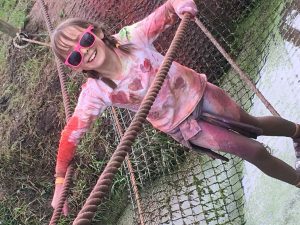 With the additional amusement of being showered in a rainbow bomb of colours at various points along the course. 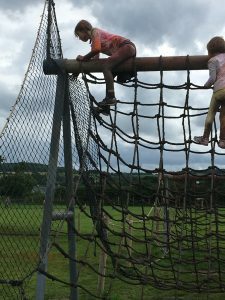 Hattie was able to complete each of the obstacles whilst it still remained fun for bigger kids and the grownups. We all had a fantastic day and would definitely worth a visit whilst you are staying at Smallicombe Farm if you fancy an action packed, muddy, family day out. Wearing old clothes and taking a clean set is advised and there are outdoor showers to hose off. The small onsite café has its own pizza oven, homemade cakes and warm drinks so you can refuel and warm up after. We were there around 3 hours and did around 3 times around the assault course followed by a quick change and refreshments. Ticket prices are £7.50, and £4.50 for under 1m.